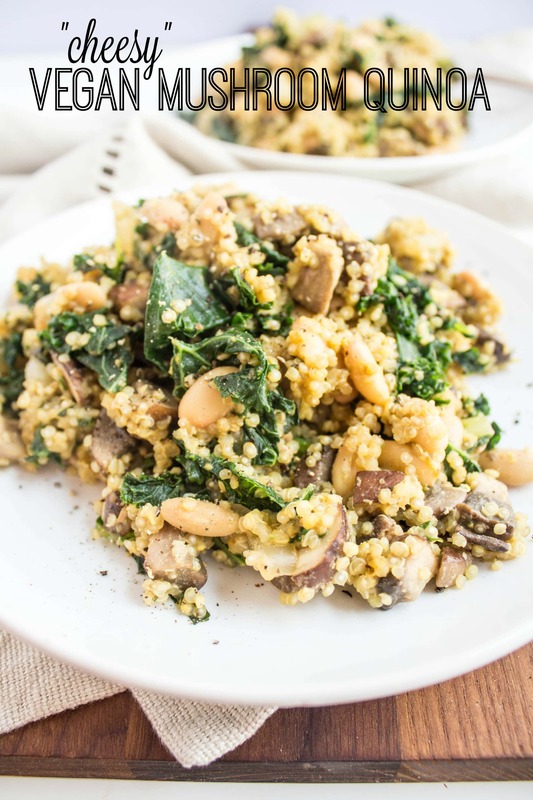 This “Cheesy” Vegan Mushroom Quinoa packs a ton of savory flavor thanks to nutritional yeast, mushrooms, and coriander. It’s hearty enough to satisfy meat-eaters, but totally vegan and veggie-packed! Head over to the updated recipe page for the full recipe! Next article: This post is really random. My boyfriend is the same way. He eats everything I make, regardless of how healthy, but he always lets me know when he likes something A LOT. However, one of his favorite dishes-and he is a serious carnivore-was when I made chana masala with homemade naan bread. It is really, really nice cooking for someone who isn’t picky, but I never can tell if anyone else would enjoy what I whip up. Haha yeah Matt will definitely say when he likes something more than something else. :) He has found he really likes kale! p.s. I need to make homemade chana masala! I love that stuff. I’ve had a pint of mushrooms sitting in the fridge a few days too long, you’ve inspired me to do something with them today! My boyfriend is pretty open to most of the things I cook. He loves when I make black bean burgers, and othertimes, he just has my main dish as a side with his meat. I love that he’s not too picky and doesn’t shun healthy food. Yes, it is different from biscuit/bread yeast – it’s basically a powder that melts into food and tastes a lot like cheese, so it’s perfect for vegans. I like it on popcorn, too! Here’s more info via Wikipedia: http://en.wikipedia.org/wiki/Nutritional_yeast. Interesting, huh? My boyfriend will eat almost anything as long as he doesn’t know what’s in it. If I tell him what I’m adding before I serve it, he’ll put up a stink. you know the kid who hates broccoli or cauliflower and you have to blindfold them, plug their nose and shove the food it? This is me with nutritional yeast. My fiance will usually try anything that I make but he doesn’t always care to eat it. He is content just trying things though. I do have him to a point where he’ll eat quinoa whenever I make it. This isn’t about my significant other, but my mom is always trying to get my dad to eat little healthier things. She mixes black beans into his baked potato so he can’t taste them, and mixes baked beans into her pasta dishes too. She also likes to use a mix of ground turkey and Morning Star faux meat when she makes tacos, lasagna, etc, but doesn’t tell him about the Morning Star. He sometimes suspiciously asks “Is there boca in this? !” but always likes it in the end! This looks really good. The Boy will eat most things I cook, and has definitely become more adventuresome at meal time since we started dating. This looks fantastic! I’m actually so surprised at how far Toly has come with trying new things. He eats 10X more things than when we first started dating. He actually just got really into quinoa so I just might have to try this. Oh and I so can’t follow recipes either… I always want to change something! Over the past year, my go to snack is garlicy quinoa over a bed of kale fried in sesame oil. So easy and delicious! I’ll have to try this recipe sometime! Yum that sounds similarly delicious! Kale & quinoa are the perfect match. Yum–looks excellent. Can I come over and eat some with you? Marshall refuses to eat mushrooms. That looks absolutely delicious, Anne. I’m with Matt, though, sometimes you just have to have a chunk of meat. I need to get with the program and back to eating healthy. This past month, I have not felt up to par and have not been eating right. I don’t know what the problem is. Because I have slacked off this month with eating and exercise, I have felt lethargic and I am way to busy for this. Please give me a pep talk. Everyone has months when they are down – it’s completely normal. And you have had a LOT on your plate lately it sounds like! I know it must be hard to manage everything, but just remember how much you are helping your son’s family with all your extra work. I’m sure they really appreciate how much you’ve done for them. Yes, my husband is a super healthy eater (even before I came along). He’s the “showoff” cook in the house making homemade canned organic jams (like strawberry mojito, peach thyme, or tayberry basil), pickles, sauces & breads. He is a big meat eater though, but that’s in line with his blood type – O. So I’ve had to add a lot more meat to our repertoire, which was difficult for me at first. My stepdad is the pickiest eater ever and almost never eats what my mom makes (aka any vegetables). It was something I sorely noticed and consciously did not want with my partner. YUM those jams sound amazing! This looks delicious! I finally tried serving my boyfriend a vegetarian dish last night. I had been holding off because he is such a carnivore. I held my breath as he tasted the tofu curry. He loved it (as evidenced by his licked clean bowl). He also made the “this would taste great with some chicken.” comment. But I was so excited and wished I had bridged the gap earlier. Yay! I love tofu curry, too. My husband is always a little skeptical at first, and thinks a dish would be better with meat in it. After he eats it though he always admits he was wrong! 1. My significant other eats off of a bowl on the floor. 2. FINE. This looks good. I’ll give the damn nutritional yeast another try. My boyfriend loves fried food, but he’s always health-conscious. I’m pretty lucky, he’ll try anything I make/concoct! My boyfriend is so great to cook for–he tells me that he trusts me, and if I made it, he knows it’ll be great! :) Which is handy, because I’m always trying to feed him the healthiest stuff I can to make up for the junk food he eats way too much of. I worry about him because he had a stroke about 4 years ago (at age 40!) and I want many more healthy years for the two of us. We both like meat, so I’ll often add a little to a dish to increase the nutrition and flavor, but the rest of the dish is usually vegetables and whole grains. How scary about the stroke! It sounds like you’re doing a great job trying to improve his health – that’s great that he’s so open to anything you make! :) Keep it up! Thanks, Anne! We help each other to eat healthier and keep moving. And you help, too–most of the people I know are junk food eating couch potatoes, so it helps to have online friends who believe, as I do, in the importance of healthy eating and exercise. Thanks for the inspiration! My husband is a very good sport. He would love for me to try new recipes all the time but once I try a few and like them I tend to rotate them for awhile. He also wants his veggie dishes served with a side of meat. Ha ha.